More-or-less what our DM told us after defeating a major baddie in a single round–and poor Teran didn’t even get a chance to throw any daggers! It was pure luck, frantic “reflexes” and really good dice rolls. And that was 1000 XP each. Of course, that was only after we had to smoosh a massive centipede, refight a wasp or two, 3 brutes blocking a path, go up one side and down another of a house and agree to a positively disgusting use of a a stone-to-flesh spell to make a brick wall separating 2 halves of the basement not so separated. And in the process we almost lost one party member to a severe poisoning incident. But What Did We Eat? Oh, man, the potluck was definitely a good idea, but maybe too good. So much food and lots of leftovers means we need to streamline things a bit to avoid such mass quantities. But we had chili, Sweedish meatballs, quesadillas, tamales, chips, hot wings, mozzarella sticks, veggies and dip, Spanish rice, refried black beans, and brownies for dessert. Too much of a good thing is still too much, lol. Instead I think I’m going to propose the 3 “factions” of our group each rotate between bringing nibbles, main dish, and dessert. We’ll see how that goes. 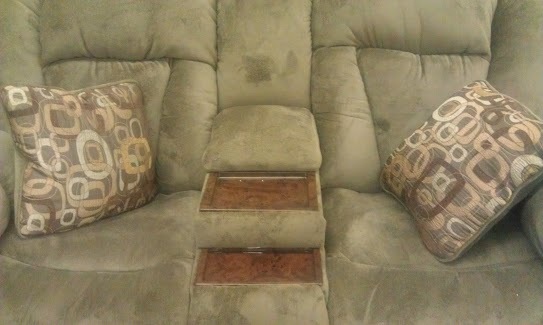 While running errands this past weekend, Todd and I decided this would make the perfect gamer’s sofa. We game around the coffee table to make use of the comfy seating but it means having to get creative with dice rolling since they have a tendency to bounce of couch cushions or roll off the maps on the coffee table. Instead we use some saved box lids (C uses a wooden cigar box)–pack rat tendencies ftw!–but this sofa had a dice-rolling tray already built in, along with a cubby in the center console (hidden by the uppermost padding) and a retractable dual drink holder. What more could a gamer ask for, right? The reason we are here and all that. Chapter 1 illustrations are nearly finished and Chapter 2 will get edited/evaluated shortly. I have to say, having everything printed out makes this project feel very much real and very close to complete, even if there are countless hours ahead spent formatting the whole kit and kaboodle.